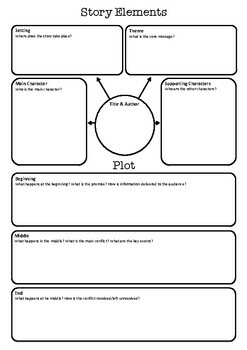 This worksheet can help your students to plan short stories before writing. It will help them to ensure they are including elements such as theme, characters, setting, plot and conflict. I've often found some students find creative work challenging and that scaffolding guides them out from the anxiety of story writing. Students should aim to complete the upper half of the worksheet before moving to the plot development section as this will help with idea generation and creative thinking. This resources could also be effective when used in conjunction with a writing prompt such as a sentence starter, an image, or even a physical object brought into the class.